Biosensors provide qualitative and quantitative data for the real-time analysis and play a very important role to sense the biological environment. A biosensor is bioelectronics analytical tool that captures the biological signal from analyte by using a physicochemical detector and translate these signals into measurable outputs. Globally, development of nanotechnology/nanobiosensors, rise in the demand for home based POC devices, and increasing glucose monitoring in diabetic’s patients are the prime growth drivers of biosensors market. 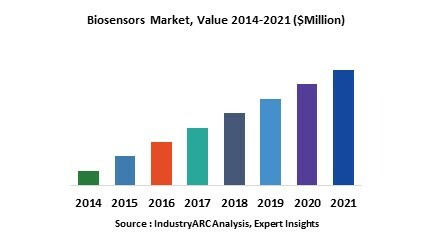 In addition, increase in adoption of biosensors for non-medical applications, such as- the food industry, environmental monitoring, and biodefense and, emerging economies such as China, India and others, will create new opportunities for biosensors market. However, higher cost of the research and development, and lack of standardization are the key restraints for biosensors market. This report identifies the global biosensors market size in for the year 2014-2016, and forecast of the same for year 2021. It also highlights the potential growth opportunities in the coming years, while also reviewing the market drivers, restraints, growth indicators, challenges, market dynamics, competitive landscape, and other key aspects with respect to global biosensors market. Geographically North America dominated biosensors market, and Asia Pacific is projected to have fastest growth, owing to rapidly increasing aging population, and modernizing healthcare infrastructure in this region. Among all the end-users, point of care testing segment has the highest market share in biosensors market. 16.2. Abbott Point of Care, INC.
16.5. F. Hoffman La-Roche LTD.